First we had owl binoculars and now comes eagle VR: give Ubisoft some lenses and an aviary and there's nothing it can't do. Eagle Flight was announced on Saturday at PlayStation Experience 2015, but as with most things VR, you can be sure it's on course for PC. You take on the feathery form of an eagle swooping through the streets of Paris 50 years after their abandonment by humans. From the trailer it looks like you'll be taking wing alongside friends, plus there's dogfighting, reminding us that eagles are best appreciated from a distance. Eagle Flight was actually present at E3 as a prototype, and those first impressions look to have green-lit the full game. The trailer alone was almost enough to make me hurl, and given my utter inability to relate my pink and fleshy form to the body of an eagle, motion sickness is my chief concern. Perhaps regurgitation is all part of the simulation. After trying the E3 demo, the UbiBlog staff reported remaining vom-free, but then they would say that, wouldn't they? Regardless, I'm excited that a large, experienced publisher is happy to pump money into a purpose-built VR exclusive. If you'd like to see how things are coming along, we put together a list of the best VR experiences already available to play. 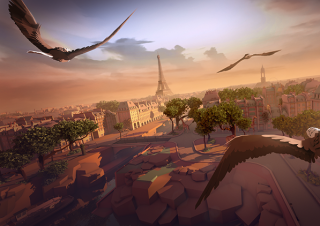 Eagle Flight will be coming to Oculus Rift and HTC Vive in 2016.